NOTE BY NANCY: The Heavens reveal great change ahead! We can see that the OLD must go to make room for the NEW. Earth and her inhabitants are in the midst of the tremendous shift to the NEW AQUARIAN GOLDEN AGE! EXPLANATION: The spacing is altered in transferring the article to Word Press. Correcting it remains only temporarily. Sorry! Saturn Conjoins Pluto, Jupiter Conjoins Vega, etc. Uranus will soon begin exploring Taurus. The Uranus Taurus ingress begins in May2018 and will be complete in March of 2019. Jupiter will conjoin the Galactic Center in its home sign of Sagittarius in November 1919. Saturn, already in Capricorn, its home sign, will conjoin Pluto in Capricorn in January of 2020. Jupiter in Capricorn will conjoin the fixed star Vega in February of 2020. Saturn and Pluto are moving toward their Aquarius ingresses. Saturn will enter Aquarius in 2020; Pluto will do so in 2023-24.Neptune is edging toward its transition into Aries (2025). The North Node will enter Cancer for the full transit this November. The Moon’s Nodes, too, will straddle the highly charged, highly sensitive Cancer/Capricorn axis. And they will all be coming within a relatively brief period of time. Some of these, especially the Neptune Aries ingress, do seem a little far off. these new change energies are already affecting us. are already telegraphing highly changeful, transformative energies. various change energies we are encountering. conjunctions will occur less than a month apart and they should be considered together. patterns we have been trying unsuccessfully to release since Pluto first entered Capricorn. anticipating this Saturn/Pluto conjunction since then. Saturn and Pluto will reduce the possibility of resisting change to zero. Basically, Saturn compels change by heightening awareness of the fatigue, inconvenience, discomfort and outright pain of flawed patterns of thought and behavior. Pluto shines a bright, penetrating light. It exposes hidden defects, often dramatically. Under Pluto’s energy, flawed, improper patterns are highlighted in unfortunate ways and blown apart. Pluto brings irresistible force to bear. It shines a penetrating, transformative light. It exposes concealed errors, thrusting them urgently to the fore. Pluto also drives us urgently to correct these defects. partially blow up bad patterns that have so far successfully resisted the forces of change. and force the transformation of flawed governmental, administrative and managerial practices that have lasted despite the near constant flow of change energies. seem to be surviving Pluto’s transit of Capricorn. seeming practices could be ended. Pluto governs the expression of power. Saturn governs legislation and legislative process. exercise of power and authority. existing political and economic patterns. transformative power has been released. from the fact that Pluto is on the Capricorn/Cancer axis. in 1778. Interestingly, this time around, Pluto will also go over the cusp of Aquarius five times before it settles in for the full transit in 2024. More revolutions followed in the 19th and 20th centuries. disappeared, or faded into the background of our collective lives. For example, in most cases, monarchy and all the customs and institutions associated with it were rendered quaint relics of bygone times. More recently, Pluto entered Capricorn in 2008, directly affecting the Cancer/Capricorn axis. Pluto will remain in Capricorn until 2023-24.
closely with the onset of a severe global financial crisis. Political transformations followed. My theory relates to the placement of Sirius. I think the power of Pluto and/or Saturn on the Cancer/Capricorn axis is related to the placement of Sirius in Cancer. Sirius is a powerful and powerfully spiritual fixed star, probably the most powerful and spiritual of the fixed stars located in Cancer. strong release of transformative worldly and transformative spiritual energy. the Cancer Capricorn axis. Let’s consider a couple of the more dramatic examples. conjunction in Capricorn in the late 1200s. (I think the most useful analogy we have is a Saturn/Pluto conjunction in Cancer at the outset of World War I.
Cancer/Capricorn axis and it did so with dramatic consequences. which ignited in the summer of 1914.
in Capricorn to produce significant political and economic change. All three elements will be involved: Saturn, Pluto and the Cancer/Capricorn axis. but about the evolution of the manner in which power is exercised going forward. will not be as destructive as the text books and some historical comparisons might suggest. upcoming Saturn/Pluto conjunction in Capricorn. will face continuing challenges to the expression of its energies. the planetary patterns seem to be disempowering the powerful. their authority (Saturn) or impose their will (Pluto). they face, much of the instability they face, was triggered by Pluto itself. hard for those in power to exercise power. Pluto’s power being impaired, Saturn’s power to dampen and suppress will come to the fore. Pluto’s explosive power to achieve stable, long-term change. After the Saturn/pluto conjunction, Pluto will move toward its 2023-24 Aquarius ingress. influence generally and weaken but especially in relation to Uranus. resistance, protest and reform, unfriendly to the exercise of power. revolt are on the rise, demonstrably. imagine what the world will look like by the time Uranus moves into Gemini. manifestations of Uranian energy will decrease. intense because it is taking place on the Cancer/Capricorn axis. cannot guarantee that the Saturn/Pluto conjunction will reform or eliminate these patterns. affect these patterns. It will doubtless further soften these defective and stubborn patterns. However, more change energy, specifically Uranian change energy, is definitely on the way. disappear. Its hold on our collective minds and hearts will be significantly weakened. adequate to the challenges of coming years. emergence of inspired, enlightening and uplifting leadership. will be exact only once. introducing an imbalance, or bias, in the 2016 US election, impeding political change. (neutralized) growing anti-oligarchic sentiment in the electorate. depend on who’s in power in 2019.
are likely to see an even faster rate of even more turbulent change. the compassion and love of the God who created it. your financial contribution most often by emails from PayPal. PayPal no longer provides a reliable way to contact the person who makes the contribution. does not identify the person fully enough for me to contact them. comfortably, please do not contribute, truly. Use PayPal.me to contribute $.99. Use PayPal.me to contribute $1.99. Use PayPal.me to contribute $2.99. Use PayPal.me to contribute a different amount. Explanation: Links to Boudreau’s PayPal do not transfer … hopefully those who want to contribute can find a link on his facebook page to contribute to him. As a former astrologer, I know that this report has taken many hours to prepare. Nessus and Chiron in Pisces are on the midheaven; Ixion, Ceres, Pholus and Quaoar are in Sagittarius in the 6th house. The North Node is in Libra in the 4th house. There is a profoundly transformative emphasis on relationships in the Saturn Sagittarius ingress chart (http://on.fb.me/1D0oaMF). A large group of bodies are spread through the 6th and 7th houses, across the descendant. This sprawling stellium will affect the full range of human relationships at a very deep level over the next couple of years, probably for the duration of Saturn’s transit of Sagittarius. Few indeed will be able to avoid the issues raised by this influence or resist the pressure to make fundamental relationship changes. In essence, we will bring our relationships into line with spiritual evolutionary goals on a personal and a global level. This 6th and 7th house influence will naturally integrate with the unusually strong emphasis on justice, fair play and sound reasoning in this pivotal chart. People will not have the luxury of retreating into the usual lies and deceptions, or self-deceptions. Some of the bodies in this grouping, however, will raise familiar relationship issues. Hence, in this status, I will focus on a subset of the bodies in this larger 6th and 7th house group. The subgroup of influences I will focus on will affect us on unusually deep psychological and spiritual levels (several levels at once) with which most have had little experience. It will also raise issues of which most of us, most of the time, are only vaguely aware or choose to ignore. The 6th house is about relationships in which both parties depend on each other for something they need or want. These can be straightforward economic or family relationships. Or the 6th house can represent the reciprocity and mutuality inherent in all bonds of love and affection. The bodies at issue (many of them are so-called centaurs) have been discovered only recently, in historical terms, some of them very recently. Their influence is not yet well understood. Although they might have been affecting us subconsciously throughout our history. I believe that we only began dealing with these influences consciously since they were discovered. I think, now that we have discovered these influences, they will become a constant in our lives and we will eventually take them in our stride. Looking back, we can see their influence over the last several decades, over the last century in some cases. They are discovering more of these bodies every few years. Even so, I think in recent years and months, these influences have been foregrounded and kicked into high gear. And what we are seeing in the Saturn Sagittarius ingress chart is a further escalation. It could be rough until we’re all broken in on these new vibes at these new levels. We might be hearing things we never wanted to hear from people we never expected to hear them from. ~ Ixion (2001) appears to govern the moral integrity of those in high office. ~ Ceres (1801) appears to represent the fundamental social imperative to provide life’s necessities for ourselves and those in our charge. ~ Pholus (1992) appears to govern our ability to uphold community standards in our personal lives. ~ Quaoar (2001) appears to govern our ability to free ourselves from existing patterns of thought when appropriate. The effects of these bodies might not be entirely clear. However, it is fairly clear that these bodies govern deep and subtle psychological and spiritual processes on an individual and collective level. The transformative influence of these bodies will be intensified by Saturn’s presence in Sagittarius. The issues they raise will be more acutely felt, more carefully considered and the need to resolve them more urgent. The 6th house governs relationships that we cannot realistically walk away from. They provide the material and emotional necessities of life. Because we cannot easily walk away from them, the combined effects of Saturn, Ixion and the other bodies on these relationships will compel us to make difficult choices, often with life altering consequences. Inwardly, we will have to confront some of our greatest fears and anxieties and begin healing our most deeply buried wounds. Outwardly, we will have to confront those who can deny us things necessary to life as we know it. Nessus and Chiron in Pisces on the midheaven square Ixion, Ceres, Pholus, Quaoar and Chariklo in Sagittarius in the 6th. The Chiron square to these bodies could motivate positive change in our conduct of 6th house affairs through illness, injury and other kinds of discomfort. Essentially, Chiron will cut through deep, old, blocks to the very core of our resistance to change. This process can release intense, long-buried emotional pain, as many of us well know. Nessus can cause severe and chronic discomfort, often of a psychosomatic nature. It might afflict those who allow social pressure to keep them from deepening their understanding and improving their handling of 6th house issues. Saturn’s influence will most likely multiply the pressure and increase the negative effects of this complex and challenging influence, dramatically limiting our options. It will also tend to force decisions we didn’t realize we’d ever have to make. It certainly appears that the planets are playing hardball. And I think it will often feel that way. But the unavoidable issues, sharp conflicts, narrowed options and hard choices will be supported by an abundance of mutable energy. Pisces and Sagittarius are mutable signs. The 6th and 9th houses are home to mutable Virgo and Sagittarius. The sharp edges in this chart are also softened by underlying structural harmonies – subtle mutual reciprocities and planetary exaltations, and so on. These are technical factors that would take a long time to explain. Suffice it to say, that they will go a long way toward helping us process these difficult and sometimes treacherous energetic currents. There is another powerful and powerfully placed supporting influence at work in this chart, the North Node. The North Node is perhaps the most powerful point in any chart. Ultimately, the North Node determines which actions the chart will support and which it will not. It also tells us how the winds of planetary justice are blowing. The inherent power of the North Node is amplified by its placement in this chart. The North Node is in the 4th house. The 4th house is the home the natural sign of the Moon and the home of the Sign Cancer which is governed by the Moon. The Moon has a strong natural link to the North Node. The Moon’s orbit defines the placement of the North Node. All of which powerfully reinforce the power of the North Node. This powerful North Node in Libra will instill a heightened desire for justice and fair play. Since the North Node determines the location of eclipses, it is also an active force for justice. The eclipses will cause events that satisfy our desire for justice. The North Node is inconjunct Nessus and Chiron in Pisces on the midheaven and sextile Ixion, etc. in Sagittarius in the 6th. The North Node makes a pair of aspects that partly, drive, partly soften and partly support the activity in Pisces and Sagittarius. The North Node is inconjunct Chiron and Nessus in Pisces. It biases the expression of these potentially harsh energies (http://on.fb.me/1D0oaMF) in favor of the North Node’s drive for spiritual evolutionary progress. These influences might still produce their often harsh effects, but the outcome would further the cause of justice and fairplay. The North Node also sextiles Ixion, etc. in Sagittarius. This will draw the effects of all the difficult interactions directly into spiritual evolutionary channels. Any actions that result would tend to flow naturally along spiritual evolutionary pathways. Given the power of the North Node in this chart, these mitigating aspects will go a long way toward softening the decidedly difficult influences affecting our relationships. In essence, the these influences will be triggering very deep and sometimes very painful mental and emotional releases. Aside from the inevitable psychological and spiritual challenges, these releases will be accompanied by conflicts in our personal and professional relationships. The energies at work in this chart will take us much closer to the root causes of the difficulties in our lives and in the world at large. We will no longer be willing to tolerate the injustice or conceal the discomfort it causes us. We will be compelled to speak or act, unable and unwilling to control our desire for change. We will all feel the need to renegotiate the terms of our relationships, person by person, situation by situation, relationship by relationship. In each case, imbalances large and small will be corrected. We will make literally trillions of large and small changes to our relationships and at a fairly profound psychological and spiritual level. These immense numbers of small changes will send seismic shocks through the world’s social, economic and political systems in the next couple of years. We speak of destructive and constructive aspects. These might best be thought of as re-shaping. Small contributions make a big difference. My heartfelt thanks to those who have recently contributed. 2015 will call on each of us to make choices: Do I choose to let go of all negative emotions, all that I have been taught on the plane of duality about myself and the way life is? Do I choose to release all fear of a God I have been taught is violent, eternally punishing and vindictive? Do I choose to get to know Mother/Father God as All-Loving … to recognize that I was created in Love and carry within me that spark of Divine Love … that I am a child-god seeking to evolve into Oneness with God? Do I choose to believe that Love Is All That Is? 2015 will be a year in which we are faced with these questions because we are moving from the planes of duality (3rd and 4th dimensions) to the 5th dimension and above where only Love and Light exists. In order to make this transition, we must release all emotions and beliefs that will hold us back. That is the purpose to all our challenges—to wake us up to the Truth that All Is Love! There is nothing to fear! Studying these Readings will grant us an understanding of what is happening in our lives during 2015. May you remember that the more you cling to life as you have previously known it, the harder it will be to face the challenges and release the old ways of dealing with them. This song perfectly describes the most positive way to live in 2015! JUMP IN & TRUST THE GOD WITHIN YOU TO SHOW THE WAY THROUGH THE CHALLENGES INTO THE LIGHT! Nessus, Chiron and Neptune have been traveling the Zodiac together for the better part of the last ten years. Neptune and Chiron have been together in Pisces since February of 2011. Nessus first entered Pisces in April of 2014 and remained there until it retrograded into Aquarius in August. Nessus’s initial foray into Pisces coincided with several of the most difficult months, psychologically and spiritually, in recent memory. http://on.fb.me/1K34rB5 Social, political and economic conditions showed improvement, but our personal lives came under great pressure. In February 2015, Nessus will complete its transition into Pisces, joining Neptune and Chiron for the full transit. They will all remain together in Pisces until 2018 when Chiron enters Aries. The force of this grouping will be accentuated by squares from Saturn. We are dealing here with a rare and unusually intense dose of difficult and unfamiliar energy. In a sense, we are being blind-sided. To the best of my knowledge, these three bodies have not been together in Pisces since at least 650 A.D., probably a lot longer, and more than a thousand years before any of these bodies were discovered. ( 650 A.D. is the earliest date for which data on Chiron are available.) It will not happen again until about 2502 and for only a comparatively brief stretch. Saturn will be in Cancer. Indeed, it is rare to find these bodies together in a single sign at all, especially with a difficult aspect from Saturn. In all those centuries between 650 A.D. and now, Neptune, Nessus and Pisces were together in the same sign once, in Sagittarius, in 665 A.D. Saturn was in Capricorn. On the macro level, this triple transit of Pisces could bring a significantly higher than normal incidence of natural and man-made disasters, including instances of violence and hardship. The energies will all but certainly manifest negatively on the individual level. However, on both the collective and individual levels we are likely to benefit somewhat from the immunity conferred on us by Nessus’s temporary stay in Pisces last summer. Many of us got to grips with the energies of Neptune, Nessus and Chiron in Pisces then. By all accounts, it was rough. Hopefully, some of those lessons stuck. Chiron wields the power to forcibly break down our ego’s resistance to psychological, spiritual and moral growth. Chiron often precipitates spiritual crises. On the individual level, Chiron often works through emotional or physical injuries, which are often, but not always, karmic in nature. Chiron will cause sudden, surprising accidents that bring with them sudden, surprising realizations, or expansions of mental and emotional boundaries. On the macro-level, Chiron can work through natural and man-made disasters. Working together, Chiron and Neptune will expose hidden injuries and incomplete healing. Neptune dissolves the veils of unconsciousness that hide unhealed injuries and unresolved issues. This energy will almost certainly manifest at crisis levels in some cases. Nessus governs our ability to resist negative, destructive emotions – our own or those of others. It governs, for example, our ability resist the desire for payback, or revenge, individually or as part of a group. Nessus also governs our ability to resist pressure to do wrong or to remain silent while others do wrong. Nessus is about retaining our moral independence. I strongly suspect that bad Nessus energies play a role in discrimination and the persecution of minorities. On the individual level, Nessus works by translating guilt we incur by compromising our moral principles into chronic physical or psychosomatic illness. Nessus, builds strength of character over time. It teaches us to maintain a positive, patient, compassionate attitude toward ourselves and others – to do and say the right thing – despite our own discomfort. Long term. On the macro-level, Nessus will teach us to resist war hysteria, for example, as well as racism, sexism and other forms of discrimination. I am not sure how Nessus achieves its effects on the macro-level. It probably isn’t pleasant. Neptune and Nessus in combination will penetrate and dissolve the veils that conceal moral weakness and ‘motivate’ us to overcome those weaknesses on both an individual and a collective level. ~ Saturn in Sagittarius Squares Nessus in Pisces: May 2, 2015 and Sept. 26, 2015. ~ Saturn in Sagittarius Squares Neptune in Pisces: Nov. 26, 2015, Jun. 18, 2016 and Sept. 10, 2016. ~ Saturn in Sagittarius Squares Chiron in Pisces: Dec. 28, 2016, Apr. 30, 2017 and Nov. 2, 2017. Saturn leaves Sagittarius for the full transit of Capricorn in December 2017. The troublesome trio will remain behind together in Pisces until 2018 when Chiron enters Aries. Many of the negative patterns in our lives and in world events are the result of negative patterns imbedded and preserved in our individual ego or in our collective unconscious, or both. As long as those patterns remain essentially unchanged in our unconscious, social, political and economic reform can only go so far. Our ego, or the mass mind, will block reform and progress, trying to keep its embarrassing secrets hidden, its pain buried and its illusory comfort and imaginary security assured. Neptune, Nessus and Chiron in Pisces, with an assist from Saturn in Sagittarius, will help us overcome and overpower the ego’s resistance to the removal of these defective patterns. In that way, these planets will dramatically increase the scope and pace of social, economic and political reform. Even the very wise have difficulty understanding what is the result of karma and what is the result of random, impersonal and unavoidable circumstance. Often they are the result of sacrifices made in the interests of spiritual evolutionary progress. We need to be mindful, too, that, despite the releases triggered by this influence, we will be experiencing the power of the positive synchronicity of Saturn’s Sagittarius transit in our lives. http://on.fb.me/1K34CMS While we are enduring what might turn into a marathon release of psychological and spiritual negativity, we will probably not have to worry also about global economic and political collapse. My heartfelt thanks to all those who have recently contributed so generously. Please do not feel obliged to contribute to my work if you cannot do so comfortably. You are realizing that you are indeed beings of Love, created in Love. 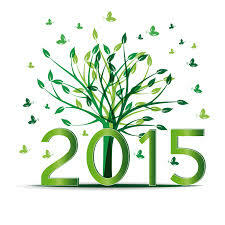 The New Year, 2015, is nearly upon you, and I can assure you that it has some wonderful surprises in store for you! Yes, I am being optimistic and up-beat because your task is to keep your spirits high so that you remain in the “fast lane” towards home, and one of my tasks is to assist and encourage you. But that does not mean that I am misleading you! I would never do that. However, many of you are feeling disappointed and let down because it seems to you that “the event,” for which you are all waiting so enthusiastically, has at best been delayed and at worst is a delusion that you bought into because the world situation appears so grim, and because you desperately wanted and needed something uplifting and inspiring to cling to. Well “the event,” your awakening into your natural and fully conscious state, is more real than anything you have ever experienced within the illusory environment that seems to hold you unwillingly in its clutches. Truly you are not held unwillingly, you are just afraid to let go of the illusion to which you are clinging so firmly and consign yourselves into the loving arms of your Father, arms that He patiently holds open awaiting your acceptance of them. You built the illusion, collectively of course, and you will demolish it. But its demolition will not be violent, there will be a very gentle but rapid melting away or dispersal of it as you collectively awaken into Reality. As you look around you now and see all the violence and suffering that so many are experiencing it is hard for you to conceive of such a dramatic change of scene, but humanity has made enormous strides on its path home to Love, and has made the irreversible choice to awaken. The tipping point, at which your collective embrace of Love outweighs your collective hold on fear, totally dissolving it, is the moment for which you have all been waiting. It is your move from the nightmare, which seems to enfold you all either as participators – willing and unwilling – or as unhappy observers, into an environment of harmonious and loving cooperation where you will work together with those in other realms who are on standby ready to assist you to heal yourselves and the planet when the tipping point is reached. You can have no idea of the immense variety of technologies that those from other realms will bring with them to assist you in returning Gaia to the state of perfect health that is her natural state. Over the eons, as humanity’s many and wide-ranging forms of “civilization” have engaged in unwise industrialization, enormous damage has been wreaked upon her and is still ongoing today. The technologies that humanity has been using recently to mine her for resources you consider essential or valuable are not in fact clever, efficient, modern, and safe, as large scale industrial businesses would attempt to persuade you, but just the opposite. Your alternate media has been doing an excellent job in uncovering and bringing to your attention the vast scale of damage that international industrial conglomerates have wrought upon Gaia in the last few decades, and much pressure in the way of public awareness and opinion is forcing them to reassess their operations and actually take the first essential steps towards reversing the damage that they have caused. They are resisting and dissembling, but the truth about their pernicious activities has been revealed, and they have no option but to alter their attitudes and behaviors to align with the loving attitudes of the vast majority who want humanity and Gaia healed. It is that change of heart, of attitudes, that is accelerating your progress along your path to awakening. You are realizing that you are indeed beings of Love, created in Love, and you are therefore responding lovingly to resolve issues that have been troubling humanity for eons and which, until now, had seemed insurmountable and insoluble. Needless to say they are not. It is just that humanity has been split into many different factions – familial, political, business, national, cultural, and religious – with different and conflicting egoic agendas that have prevented you from coming together to address and resolve them. That is all changing because the Tsunami of Love, which has been having an enormous effect on those of you who are consciously on a spiritual path, has been inspiring and uplifting you to engage with It and by so doing share and extend Its energy throughout all of humanity. This is the divine plan in action, and evidence of its inspiring presence can be seen in all parts of the world. Do not be misled by the mainstream media’s almost constant focus on fear, and on their reports of threats of terrorism. Throughout humanity’s long history on the planet there have always been fears, conflicts, and wars, and for those directly involved there has been much suffering, but those conflicts have always been instigated by those who would control and suppress you as they still are. Of course there are people who believe in the power of violence to bring them rewards, but they are in a very small minority. However, they have always noisily attempted to instill fear into their contemporaries and supporters in order to build fear based organizations that they can use as a means of control to achieve their own selfish agendas by ensuring that governments do their bidding. This state of affairs is coming rapidly to an end. People in many parts of the world are now very much aware of the endemic corruption in high places and will no longer tolerate it. When support for these corrupt ones falls away, as it is now doing, they are quickly seen to be straw men, weak and fearful individuals who are utterly powerless without supporters and lackeys to do their bidding. Massive changes are under way as individuals reclaim the power that they had, in many cases unthinkingly, given away to so called authorities that had been established with the sole purpose of protecting the few whose one aim is power and control over others. Many of you refer to those seemingly all powerful ones as the “dark cabal.” Dark and hidden they may well have been, but not any longer. Their influence and notorious agendas are being disclosed with, for them, alarming speed, and in that disclosure lies their inevitable downfall. Truly, the news is good as 2015 approaches, so continue holding your brilliant Light on high as you demonstrate Love in action. Visit your holy inner sanctuaries at least once daily and re-empower yourselves with the Love that is your core, your center, so that not only you, but also all with whom you interact each day are uplifted and inspired as you move forwards towards your assured awakening. A worldview, or a belief system, is a carefully chosen set of ideas that explains who we are, how the world works and how we can best fit into it. There are numerous religious worldviews. There is a single, more unified and consistent scientific worldview. There are numerous political worldviews, etc., Many mix and match worldviews. Almost everyone has a worldview, or belief system, and relies on it to navigate their life. In addition to everything else they did, the last 6 or 7 years adversely affected our worldview. So much changed so dramatically, most worldviews are now badly out of date and generally inadequate to our present needs. We cannot single-handedly create-or update – a worldview. Creating, maintaining and changing worldviews is a complex group phenomenon. And the planetary help we would need to accomplish such a group upgrade is just around the corner. The bottom line is that we’re all standing at a crucial life crossroad without a road map. The good news is that, although our worldviews are still in flux, the planets are are about to bring them into much closer alignment with reality. Neptune and Saturn are absolutely crucial to the birth, growth and evolution of ideas, including the ideas that make up our worldviews. Neptune makes ideas flexible and expansive. Saturn keeps ideas logical. Saturn and Neptune often work at cross purposes, but between them, they help us keep our ideas about the world real, relevant and reasonable. Presently, Neptune is in Pisces. Saturn will soon be in Sagittarius (December 2014). As Saturn moves into Sagittarius, we approach a pivotal moment in the evolution of the ideas that largely determine the nature of our world, the flow of events, and guide our lives. Saturn and Neptune will be in broad square relationship from the moment Saturn enters Sagittarius. There will be three exact Saturn/Neptune squares between November 2015 and September 2016. As Saturn squares Neptune, rigid, fixed ideas will become more flexible; unrealistic, inaccurate ideas will become more realistic and accurate. We will take more time to arrive at an opinion, on the one hand, and be less likely to cling to outdated opinions on the other. Our ideas will tend to mesh slowly into a more solid, stable and reliable picture of the world. This will happen on a large enough scale to bring all our idea, and our worldviews into better alignment with reality globally. This process might be of little help to those with grossly unreasonable, irrational worldviews. But for those whose worldviews are basically reasonable and just need an upgrade, these four squares will be a blessing. Their worldview will come into closer alignment with the truth of our situation and, thus, become more empowering and effective. It should also be noted that the coming Saturn/Neptune square marks a major energetic shift, away from the strictly physical and material world to the mental, emotional and spiritual realms. I know this talk of worldviews and their effect on our lives can seem impersonal and abstract. But September’s composite chart gives us an idea of just how personal and concrete the transformation of a worldview can be. I view September’s chart as both preparation for and a preview of what we can expect as Saturn moves into square relation with Neptune. It will initiate a thorough and fairly rigorous review of all the ideas we use to understand our lives. The most important and indicative aspect in September’s chart, in my opinion, is a T-Square. This T-Square involves the Moon’s Nodes, Mercury, Uranus and Pluto, Capricorn, Pisces and Leo, and the 2nd, 5th and 8th houses. In effect, it involves all the major spiritual evolutionary forces in the chart. It will affect the totality of our finances and all of our personal relationships – romantic, social, professional and otherwise. This T-Square leaves very little untouched. 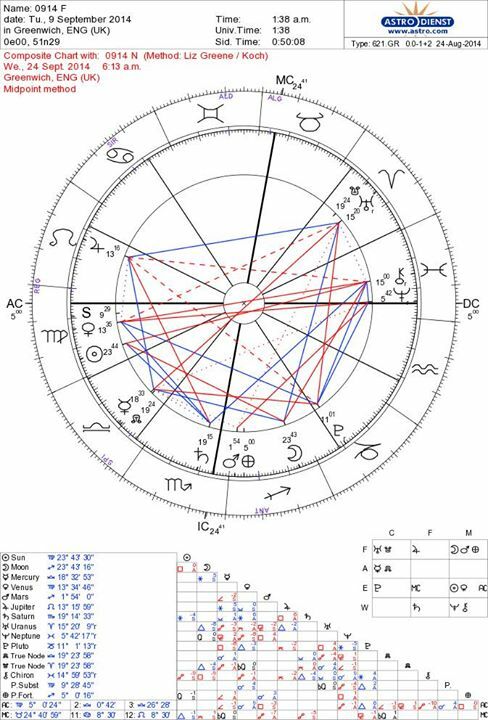 On the macro-level, the real battle in September will be between people fighting to preserve the gross inequality of the old status quo (Uranus conjunct the South Node in the 8th) and those committed to genuine economic reform (Mercury conjunct the North Node in the 2nd). The debate could be strident, rancorous and confusing. At bottom, though, the forces of spiritual evolution (North Node), will support those fighting for genuine change, as proposed by the grassroots. False arguments in support of injustice and inequality will finally be understood to be untrue. The Yod in September’s chart indicates that we could all experience this confusion and conflict in an intense and deeply personal way. The mental and emotional turbulence of August is probably not over. The Yod involves Pluto, Chiron and Jupiter, the 5th, 7th and 12th houses, and Capricorn, Pisces and Leo, respectively. Generally, this Yod will produce persistent, rapid, see-saw tensions over spiritual, moral, social, cultural and relationship issues in general and romantic issues in particular. These tensions will push us persistently and repeatedly to spiritualize all our relationships. It could also compel us to modify or end relationships that do not work for us on a spiritual level. Alternatively, the Yod will push us to change relationships so that they do support our efforts to spiritualize our lives. September’s composite chart is a full, slowly boiling cauldron of transformational and disruptive energies. Try to imagine what it would be like to immerse your mind and your emotions in this cauldron. September’s chart will send continuing swarms of mental and emotional shocks, large and small, through our lives – at home, at work, at play, on individual and group levels. These numberless shocks will open cracks between ourselves and our most important friends and allies. Disillusionment and realization will alternate in close, rapid succession. That, in turn, could subtly undermine our social and professional lives as well as give us room to maneuver. The same basic process will occur on the macro-level. This effect will be pervasive and global. Long-standing political and economic loyalties will come apart, slowly but surely reshaping the political and economic landscape. This will be its own source of excitement and stress for anyone caught up in these events. And to some extent, we are all caught up in these events. All of this can cause persistent, low-grade stress that, over time, will undermine our sense of mental and emotional well-being. This, in turn, could undermine our physical health. By the same token, it will undermine peace and stability at the community, state, regional and national levels. But that is not the last word. The last word is an encouraging one. We must not be disheartened at the thought of so much instability. Underlying harmonies in September’s chart tell us that a new consensus is already taking shape, a solid foundation is forming in the deeper levels of our minds. We are already creating the foundation for a new stability. Unlike the seemingly open-ended stresses and strains of recent years, these stresses and strains will come with an end in sight. There is, for example, a subtle form of reciprocity between the chief planetary players in September’s chart. Aquarius is the natural house of Uranus. Aquarius occupies the 6th house, the natural house of Mercury. Hence, we find a degree of reciprocity that will help moderate the high voltage Mercury/Uranus opposition and help us find resolution. There are other such factors at work in this chart. Also, despite what is sure to be a strident and rancorous debate, the sheer power of this Yod will work in favor of compromise. It is powerful enough to force genuine and lasting changes on all levels. The Yod is driven hard by Pluto and, with Chiron, will produce pressures uncomfortable or painful and urgent enough to force accommodation. The sheer strength and relentlessness of this dynamic Yod will push people toward compromise and consensus. Those ceaseless little shocks to the system that drive things apart will also be providing the flexibility we need to form new, more productive alliances. The subtle, pervasive destabilization caused by this Yod will also open us to deep, subtle forms of inspiration and guidance and give us the freedom and the motivation to act on that guidance. Finally, as Saturn moves into Sagittarius, we will benefit from a broad (Saturn, Uranus, Jupiter) trine in fire signs. This broad trine is especially favorable for large, complex changes that require wide-ranging coordination and cooperation. It will begin in December when Saturn enters Sagittarius and fade when Jupiter leaves Leo in August 2015. Beneath the turbulence, hidden behind the clouds of turmoil and the din of public debate, good things will be happening. We must not allow ourselves to be so overwhelmed by the stress of these changes that we lose sight of the good stuff – the reasons for hope and confidence in the future. *This analysis is based on a composite chart, combining information for the new and full moons of September 2014. “June’s chart indicates a major turning point for everyone that will change their worldview and ripple through all of their relationships, and on out into world at large. Filed under: Astrology, Carl Boudreau |	Comments Off on The Astrology of April 2014 – New Paradigm?